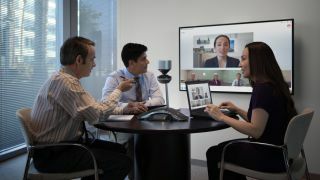 Polycom is launching two 360-degree videoconference stations built to work with Microsoft Lync. The Polycom CX5500 and CX5100 Unified Conference Stations have been developed under its strategic alliance with Microsoft to align with the latest version of the communications platform. Mayur Pitamber, Solutions Product Marketing Manager for Polycom, told TRPro that that the CX 5100 is made to work exclusively within a Lync environment, with the 2010 or 2013 versions. It provides video and audio capabilities and can be plugged into a USB port on a laptop. It doubles as an session initiation protocol (SIP) audio conference phone. The CX5100 can be used for videoconferencing with Lync or any communications systems using SIP, which includes any from BT or Virgin. Both models deliver 1080p active speaker video that automatically tracks the flow of conversations at 30 frames per second, and can be used with the recently announced Lync Room System, which brings together 360-degree cameras with touchscreen monitors and a tabletop touch controller. Both are due to be available in the fourth quarter of the year. Pitamber said that Polycom's alliance with Microsoft is likely to play an important role in its future product releases. "Lync is being deployed by more and more enterprises and SMBs, and it makes sense for us to work closely with Microsoft," he said.